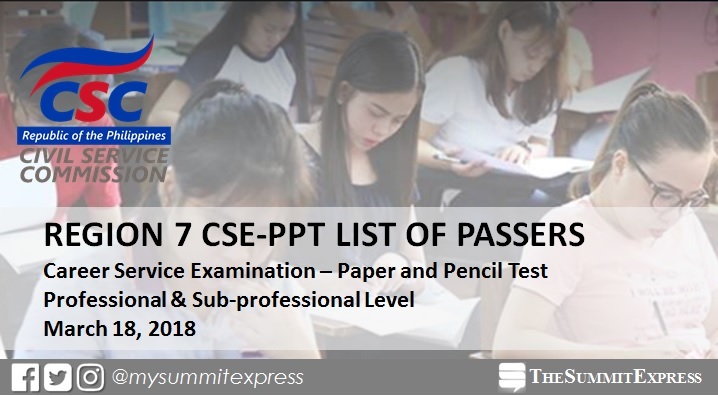 MANILA, Philippines – The March 2018 civil service exam results known as the career service examinations - paper and pencil test (CSE-PPT) together with the full list of passers and top 10 (topnotchers) are posted on this page as announced by the Civil Service Commission (CSC) on Wednesday, May 16 or within 60 days after the exam. CSC named those who passed the professional and sub-professional level of examinations. View on this page the full list of passers for Region 7 (Central Visayas) which comprise of the following provinces: Bohol, Cebu, Negros Oriental, Siquijor. 76 ANCHUVAS, MICHAEL VINCENT A. 104 ASENJO, JOHN MITCHELL J. 151 BAROTIL, MARIA CATHLYN S.
179 BINOLUAC, ART VINCENT L.
271 CATALUÑA, SIEGFRIED DARYL A JR.
358 DEMECILLO, DEMS REY T.
445 FLORENDO, EJIN KYRE A. 490 GILBUENA, NEIL JUNE G.
709 MONTEBON, JO ANN B. 902 RUELAN, MARK REVIN L.
996 TANGPOS, JENNY ROSE B. 1021 TIONGZON, CLINT DALE B. All takers may get their individual test results using the OnlineCivil Service Examination Result Generation System (OCSERGS), which can also be accessed through the CSC website 15 days after the posting of the List of Passers. Passing the civil service exam would result in the conferment of either Sub-professional or Professional eligibility. Sub-professional eligibility is appropriate only to first level (clerical) positions while the professional level is appropriate up to second level (technical) positions. Said eligibilities do not apply to positions that involve practice of profession or that are covered by special laws. The CSC said that eligibility is a minimum requirement – along with education, experience, and training – for permanent appointment to government career service positions.